You find yourself stuck in a mine. The only way forward is blocked. Can you find something to remove the blockage. If you can, move forward until you find a small tunnel, this will lead to a possible escape. 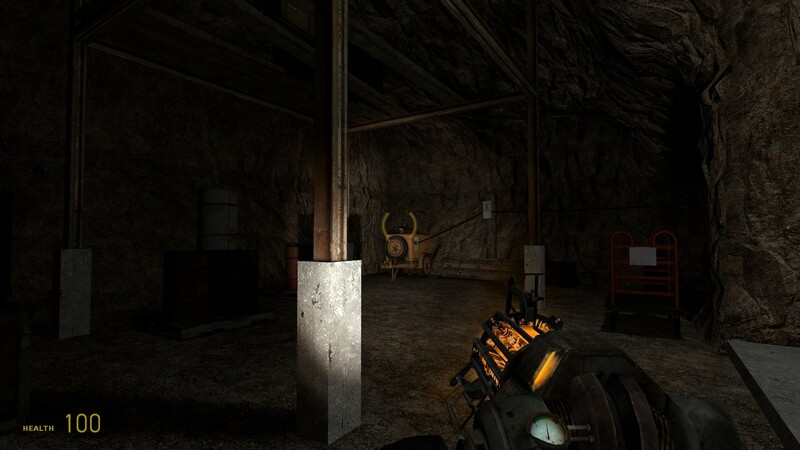 Copy the hl2_mineshaft.bsp file into your …\Steam\SteamApps\common\Half-Life 2\hl2\maps\ folder. 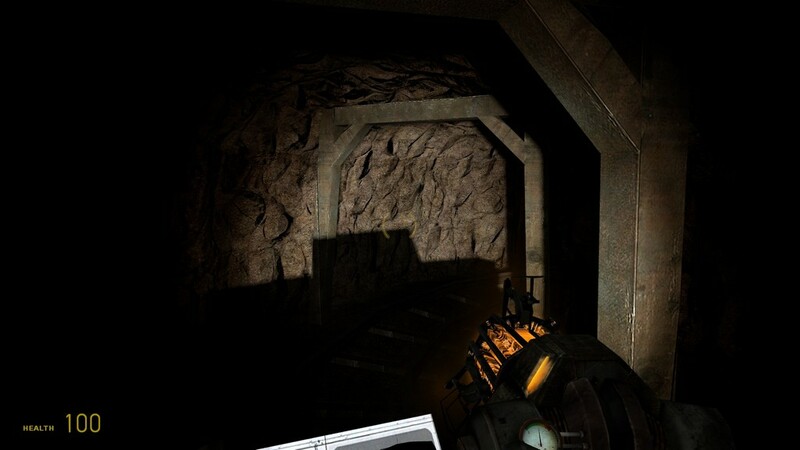 Open the console and type map hl2_mineshaft and press Enter. Longest: 1 Hours by olof. I’m guessing this took me way longer than it should because I couldn’t find a way past the boards. I was assuming I needed to destroy them but I didn’t. Anyway, the map could do with a little more lighting but the location and quantity of enemies is about right. The gameplay was fairly well balanced with the final fight being slightly too easy because you can stay in the little tunnel and fight from there. The author should have made the play drop into that large arena. I have Said Play It but not because it’s fantastic but because it was quite enjoyable. I can’t pickup health and ammunition. Anybody else have that? How have you installed it? However, I have already solved the problem by reinstalling everything, including steam. Can someone tell me what I have to do with those dynamite? This two dynamites is for this big stone on the rail track. After my “train” stopped (dont know the exact word of this thing) i walked to the end with a large arena at the other side of the wooden wall. But i didnt find the clue to pass this wall of planks. You’re not supposed to pass the wall. Find another way. Look around you. The flashlight was very annoying, for the rest I thought it was pretty good, though not very long. Puzzles were nice, fighting a little annoying sometimes. Starting with what I liked about the map, I thought that the “mine cart” helped define what points your progression was blocked at, and it was kinda neat riding it deeper into the dark mine. As for the mine itself, it was definitely, well, mineshaft-shaped. 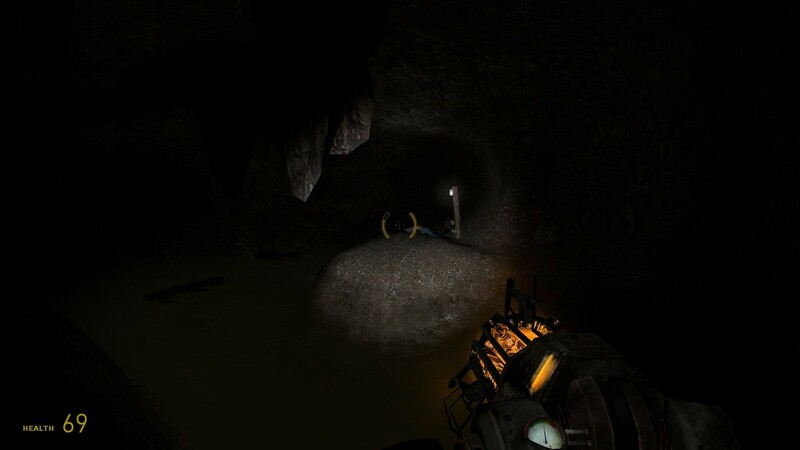 I especially liked the flooded shaft, with all the floating debris and abandoned lights. Gameplay-wise, I think that the ammo pick-ups were fairly well-placed; I found myself discovering shotgun ammo mid-fight, the moment I spent my second-to-last shotgun round. In the negative, I found it really difficult to find what was needed to progress. 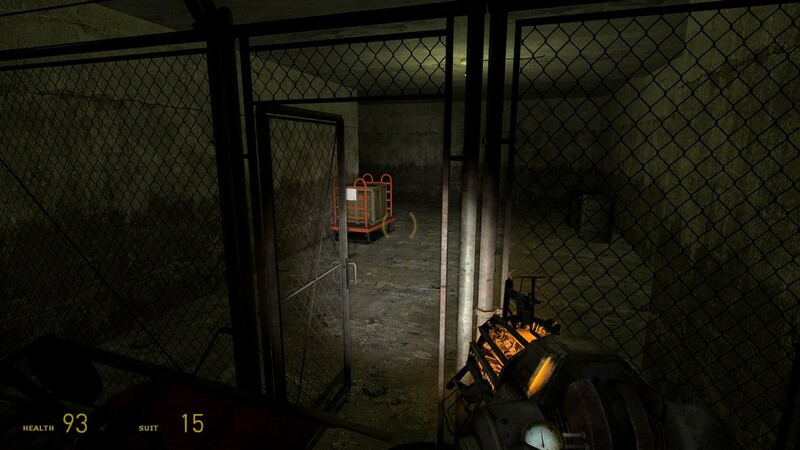 When I got to the elevator, I had a surprising amount of trouble triggering the button; I actually figured that the elevator was broken, and managed to carefully jump my way down the support beams Ravenholm-style. Of course, I was met with a dead end and no way back up, so I figured that the map was over. After some noclipping, I realized that there was more to go, and finally managed to get the elevator to trigger. 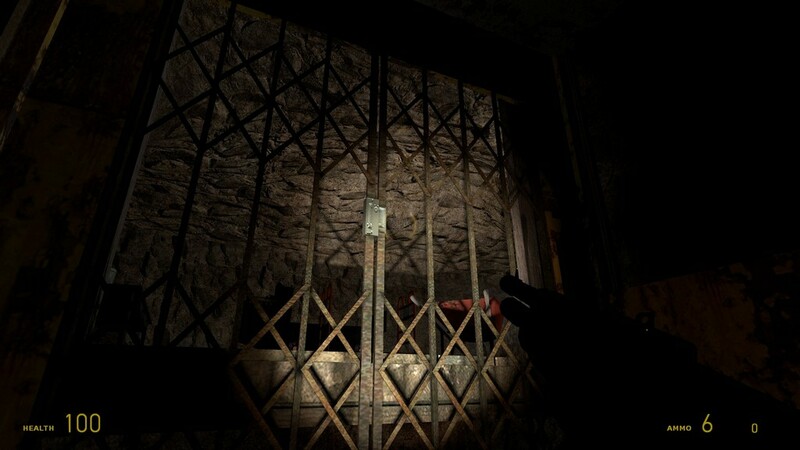 I had a similar issue with the boarded-off tunnel, trying to find a solution until giving up and noclipping through, at which point I found the exit of the little tunnel. 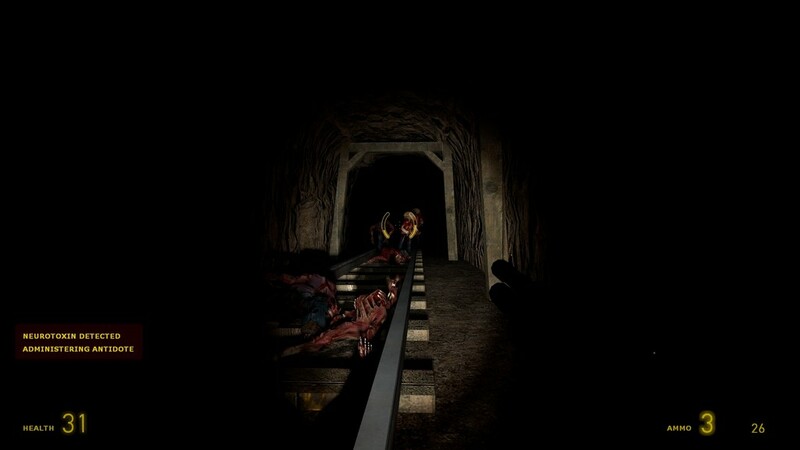 The entrance simply wasn’t visible enough, considering the extremely dark tunnel and the wooden beam next to it. I found the decision to make half of the weapons hidden and away from the main path of the map very strange, especially considering the volume of zombies placed in the map; I can’t imagine having much fun if I had missed the .357 in the rafters and the SMG2 deep in the flooded tunnel; leaving only the shotgun, gravity-gun, and a grenade. Overall, I think that the map would’ve been a quick bit of simple fun, had I not dealt with the frustration of trying to progress and keep my pre-EP2 flashlight from running out of power mid-fight. I played most of this in noclip / fullbright / god mode. That’s … not a good sign. On one hand, visually (what you could see) the map was both interesting and well detailed. The work that got put into the map however was pretty much destroyed by the fact that it’s so completely dark you can’t see any of it. I’m not a fan of maps that make you use the flashlight for more than a moment or two to get through exceptionally dark areas. This one… was exceptionally dark all the way through, and was not fun to look at. My old eyes are not okay with dark maps – and I’ve habitually complained about the darkness of my monitor on top of that so I am already compensating by cranking the brightness and gamma on the game options. Too dark is too dark. The other, game breaking, problem was: no idea what to do. Tried to get through several places, if we were meant to use explosives I didn’t see why or how, if we needed the grabbity gun it didn’t do anything when trying to punt objects which I know in theory are supposed to move when you hit them. Were we supposed to take the mine car farther than any given little bit? Why bother giving it to us if it only went 50 yards? 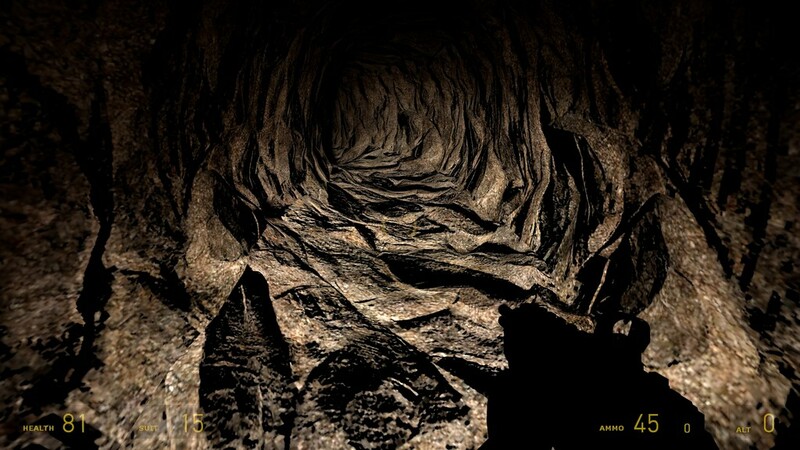 The mine shaft itself seemed…. um, lackluster if I recall, because the one spot I got to in it led nowhere and you had to just leave? It was at that point I just gave up and noclipped around to see the rest of the map with greater ease. I didn’t bother fighting the zombies, they were too plentiful and there was not enough indication of where I was headed, to know which ones to just leave alone. ANY kind of hint to the player that they need to head a specific direction, use a tool, or do some action, would have helped here. As it is, it is basically a “play around in the tunnels” map, with no clear reason to go in any direction. Triggered events, like ‘when their back is turned, cause the rock slide to block their path behind them’ will allow the player to know that “back” is no longer the right option. Exploring is fun, but didn’t seem to come with any real reward or penalty besides making me more confused as to where I should go. Light. Just… use it. Use enough light to show off your map design. Without enough lighting, no one can see the work you put into details. Direction. There was none. Show players at least a hint at what they need to do, and don’t leave too many red herrings around, that just causes frustration when you realize ‘the solution was right there all along’. That, or being able to choose freely AMONG those different options to do the same thing in the long run, that would be fine too. Clear Goals. No idea what was going on in there, but… yeah. 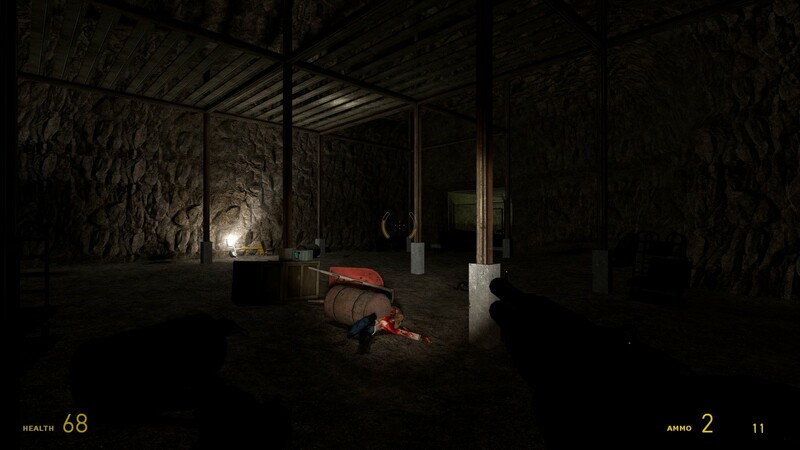 Beating up on zombies in a mine isn’t its own goal, when it seems like there should be hints left and information to at least follow. “I think I saw another mine shaft out here, but I don’t know how it connects! Go find it!” Flavor text or even a voice over, would at least help set the tone. Its a nice work. Good puzzles sections and fighting sequences. I like atmosphere in this map. Design is quite nice, of course it is very dark and player must use flashlight in 90% of the map, but for me its not a problem. Enjoyable map. 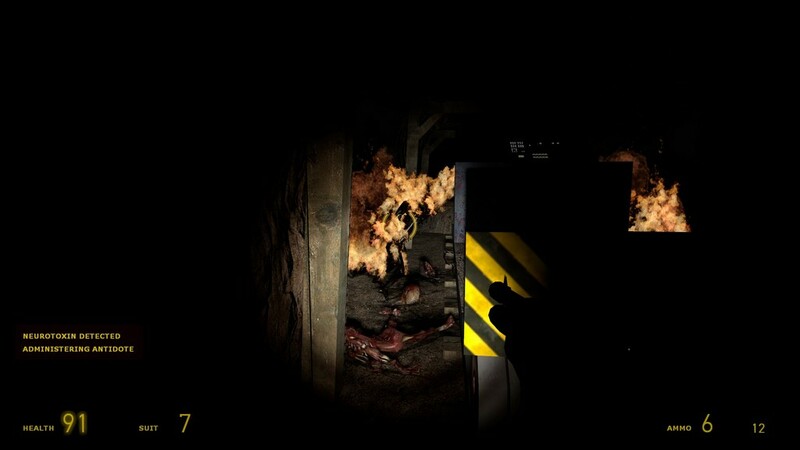 Spooky sounds, dark atmosphere, nice puzzles and fight. Nice map. This is the 7th map on the list. Dark zombie map. Biggest problem I had was with the elevator at the beginning. The buttons on the outside dont work at all and the button inside requires a very precisely positioned crosshair for it to work. On top of that, I also jumped down the shaft after assuming the elevator doesnt work, and that will get you permanently stuck. As is wasting the 2 dynamite sticks. And there’s no warning at all. Challenge, however, is fairly tough and, although annoying, having to constantly deal with the flashlight going out adds to the challenge. Weapons are hidden pretty well but the shotgun is hard to miss so you won’t be completely helpless. Well this feels like a solid Play It Later. 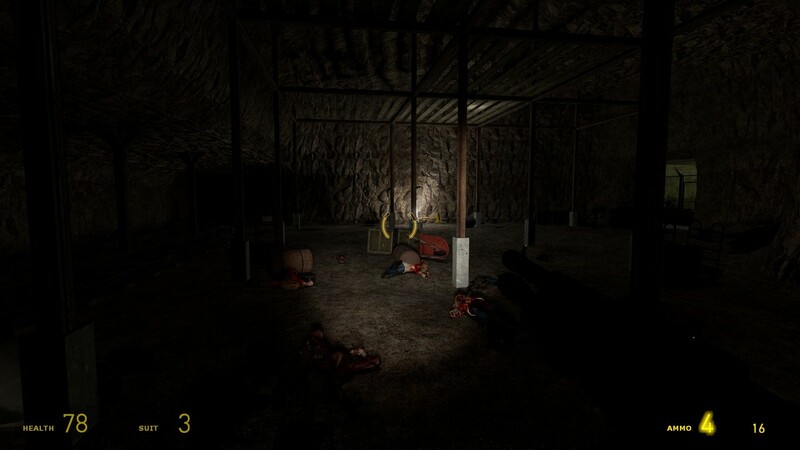 Overall combat was well balanced and it was not annoying to have the zombies and head crabs as the main enemies. The puzzles were OK but I got a little confused once the cart stop like in the middle of the road. The last combat arena was quite challenging and the end felt it came sooner Than I expected. All in all an OK map to play in few minutes. The general look of the map and having to rely on the Gravity Gun to fight enemies would have made this mod an enjoyable play weren’t it for the flashlight. 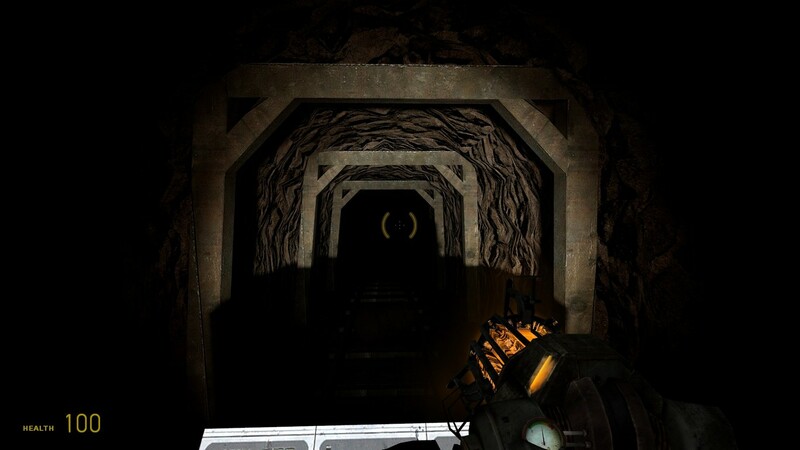 The Half-Life 2 flashlight drains much faster than the original’s and could’ve used a small script or a little more map lightning to avoid being frustrating. With the problem mentioned above, you should really consider playing this map. I don’t think the puzzle segments will be that much of a trouble as the areas themselves are quite small. There’s not a lot to be said about this map. It could have been a solid PIL if it wasn’t for the incredibly dark lighting and the insane amount of enemies in a single area. The level design, apart from being really dark, was enjoyable at least. The part with the dynamite was confusing at first tho. Overall, this map is simple nice. Not the best map out there, but certainly not one of the worst either. The rail was pretty buggy and you had advantage on the enemies all the time. But it’s a good map overall, not the best, but a good one. This single map was interesting. It had some neat ideas here and there. But I feel like there were a lot of missed opportunities. I think that the whole mine cart mechanic that was to sort of be like On A Rail from HL1 wasn’t utilized to it’s full potential. And the variety in enemies was lacking. I think Antlions could’ve been worked in and maybe even Combine Soldiers? 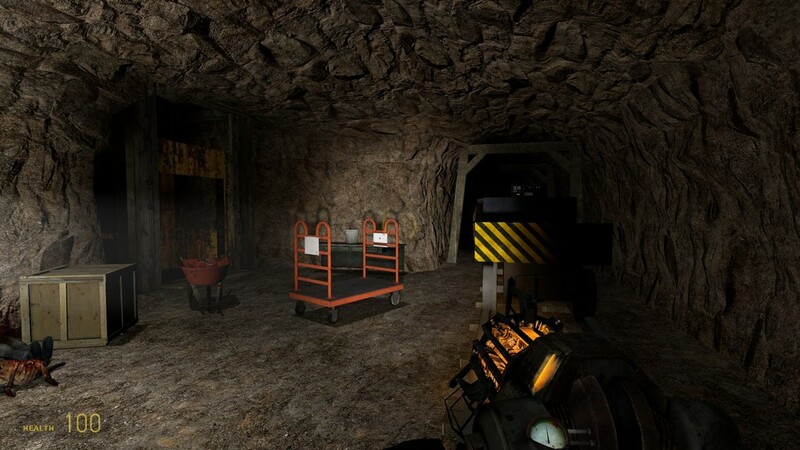 Like, you could’ve had them break in to the mines at the end of the map and get into a fight with the large number of zombies while also trying to kill you. But as it is, you only fight herds of zombies but it was stil pretty fun. 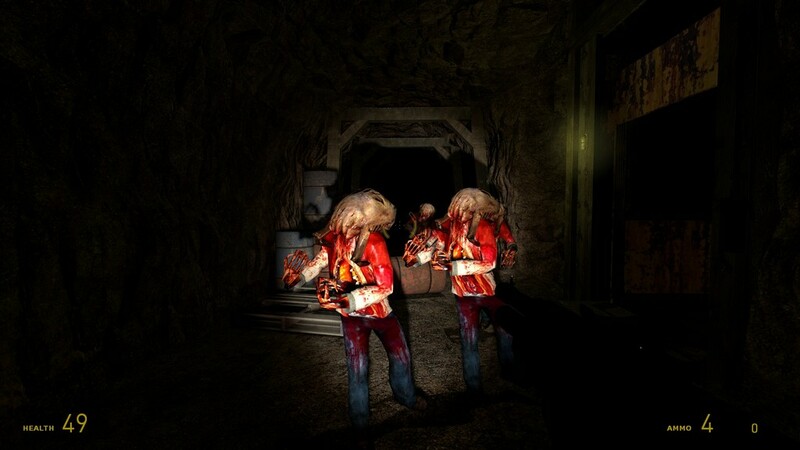 With the large number of zombies and the darkness of the tunnels, I think this could’ve been an interesting attempt at a horror experience. But you get enough supplies to fight them off and it just felt a little too easy. The idea with the TNT was interesting and the music used was a good choice but aside from that, this was just an okay Half-Life 2 map. Check it out for yourself and see if you like it.